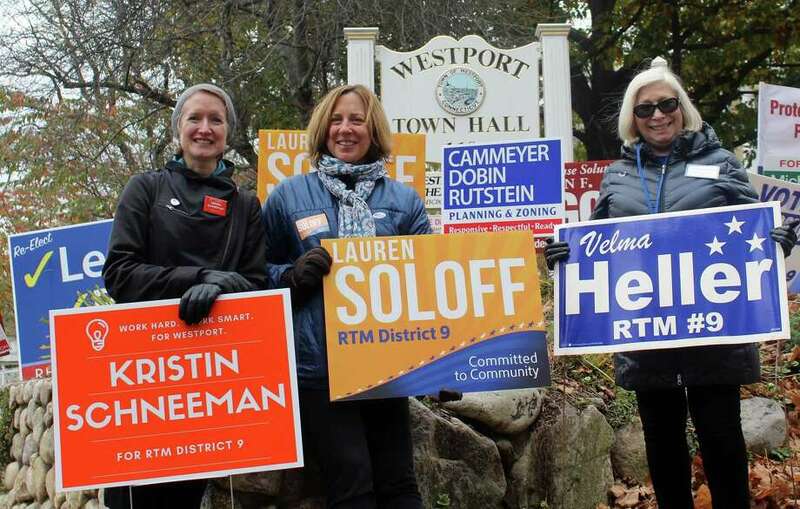 District 9 Representative Town Meeting members Kristin Schneeman, Lauren Soloff and Velma Heller held signs outside Westport Town Hall on election day Nov. 7. They all won election. WESTPORT — In many ways, to hear Kristin Schneeman’s personal history is to take a tour of some of the greatest events, political developments and ideational innovations of the last three decades. But before Schneeman, a 52-year-old Westport resident, won an Emmy Award for a documentary on the Iran-Contra affair, worked as a chief-of-staff in the Clinton White House, or served as a director for an organization seeking to speed up medical research, she grew up in the tiny, rural Pennsylvania town of Bellefonte outside of State College, where her father worked as an English professor at Pennsylvania State University. “It was a good place to grow up, but it was also the kind of place you might want to get away from,” Schneeman said of Bellefonte. After high school, Schneeman majored in history at Bryn Mawr College, a women’s college in the suburbs of Philadelphia, which she said she loved. Schneeman had no idea what she wanted to do out of college, however. One day she was sitting in the dean’s office discussing what she might want to do when a Bryn Mawr alumnus called asking if a student wanted to intern with her at ABC News over spring break. Eager to spend a week in New York and perhaps meet journalist Peter Jennings, Schneeman leapt at the opportunity, but didn’t think television would become a passion of hers. Yet after college, Schneeman connected with a woman in Washington, D.C., who worked as an independent producer of films for the PBS “Frontline” series. “I had three jobs and was working 18-hour days, and finally the “Frontline” thing turned into a full-time, poorly paid job and that was amazing,” said Schneeman, who worked on “Frontline” films about the HIV/AIDS crisis and inner-city poverty. In 1991, Schneeman and a team of filmmakers won an Emmy for research on the “Frontline” documentary “High Crimes and Misdemeanors,” about the Iran-Contra affair. The independent producer Schneeman worked for was married to Greg Simon, who was named Al Gore’s domestic policy adviser in the White House, needed an assistant, and asked Schneeman if she would consider the position. “It was totally out of the blue, but this opportunity is probably not going to fall into my lap again, so I should probably say yes, and if I hate it I can quit after a year,” Schneeman said. As Simon’s front-line manager and chief-of-staff, Schneeman helped lay the policy groundwork for the expansion of the nascent internet and worked to increase access to the internet and new computer technologies in schools. “It was an exciting place to be in the early 90s when the internet was a new thing for most people, and not yet the platform it is today, but when its potential was just becoming clear,” Schneeman said. Schneeman stayed for the administration’s first term before moving with her now-husband to Boston. Once in Boston, Schneeman worked briefly for the short-lived gubernatorial campaign of Joseph P. Kennedy II. She then took a position as a director at the Harvard Kennedy School’s project on future challenges facing governments, where she convened the first-known conference on the use of internet in political organizing. Schneeman then met Steven Grossman, a politically connected Massachusetts small businessman who previously served as chairman of the Democratic National Committee and was running for Massachsetts governor. Schneeman became the first employee on Grossman’s campaign, where she served as issues director and spent the better part of three years driving around the state with Grossman connecting with voters. “Going to so many different places, meeting so many different kinds of people, talking to them about what they cared about, and having ice cream in 351 cities and towns in Massachusetts was great,” Schneeman said. Grossman dropped out of the race in advance of the Democratic primary, which Schneeman said was sad but allowed her to spend time with her mother in Chicago. Following her mother’s death, Schneeman became pregnant and didn’t consider it a great time to get a new job, although she did some work for a Harvard Business School professor. In 2005, Schneeman and her family moved back to D.C. and she called her old boss from the White House to see if he knew of any job openings. He found a position for her at a nonprofit he had recently started called Fastercures, a center of the economic think-tank the Milken Institute. “Science is hard, and it’s unpredictable so there’s sometimes good reasons why things can take a long time. But it turns out, there’s also lots of not so good reasons that just have to do with lack of communication, the right incentives and collaboration and all sorts of things that are more about human behavior than they are about science or technology,” Schneeman said of her work at Fastercures. Schneeman’s husband was recruited to Bridgewater in 2010, so they moved their two daughters, now 12 and 15, to Westport. However, she has continued her work with Fastercures remotely to cut the roadblocks that slow medical progress. Last November, Schneeman took her decades of work in politics and policy to Westport and was elected for the first time to the Representative Town Meeting from district 9. Two years ago when Schneeman realized the state’s financial situation could impact education funding in town, she became interested in gettting involved at the local government, an interest which solidified after the 2016 presidential elections. “Somebody asked me if I would consider running and I thought, that’s ridiculous, why would I ever think about doing that? In high school, I was the stage manager, never on stage. On the campaign trail I was the issues director. I’m not the candidate. It’s not something that would naturally occur to me, but then I thought OK, that was a serious question and I should think about it seriously and I just thought, why not?” Schneeman said. On the 36-member RTM, Schneeman figured there would be safety in numbers, but she has found a voice of her own. She can frequently be found at town government meetings providing comments on some of the biggest issues facing Westport now, such as the potential addition of police officers in the schools. “I thought it would feel gratifying to focus on solving local challenges with my neighbors in a civil fashion. That was my vision or my hope, and I’m glad I did it. I’m very glad I did it,” Schneeman said.